Luxurious, stylish and deceptively easy, the broomstick lace-filled Hugs and Kisses Scarf and Hat set is a perfectly coordinated set to last you all winter long. Together the hat and scarf provide all the warm woolen hugs and kisses one can ask for in winter time. Esc (extended single crochet): Insert hk in next st, YO, draw yarn through st, YO, draw yarn through first lp on hook, YO, draw yarn through 2 lps on hk. This scarf is started with a sc foundation row for the entire length of the scarf. Then the body of the scarf is worked and after that 2 rows of broomstick lace are applied on each long side of the scarf. Scarf length may be adjusted by adding or subtracting multiples of 10 from the sc foundation row. The dowel needed for the broomstick lace does not have to be long enough to accommodate all sts. As long as the newest lps can be put on, it is all right if the older lps fall off of the other end of the dowel. Row 1: Ch 2, sk first st, 2 esc in next st, * sk next st, 2 esc in next st; rep from * across, turn. Rows 2-10: Rep row 1. Row 11: Ch 1, sc across, turn. Row 12 (WS): Place the lp over the dowel, then * insert hook into next st, draw a lp through and put it up over the dowel. Rep from * till end. Row 13 (RS): * Insert hook into the first 5 lps, YO and pull through the 5 lps on your hook. Work 5 dc into the lp. You can now remove the dowel from all the lps. Rep from * until all lps have been worked. Row 15: Rep row 13. Fasten off. 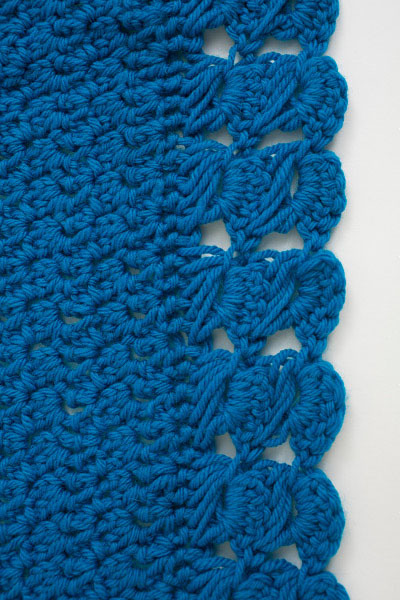 Turn work to apply lace to the other long edge of the scarf. With the WS facing, insert hook in the st most right and pull up a lp. Rows 16-19: Rep row 12-15, do not fasten off. 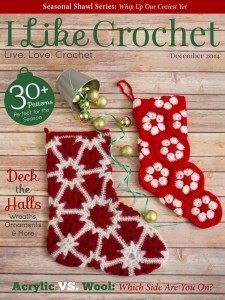 Row 20: Turn work sideways and apply sc along the short edge, spanning the open areas of the lace with 3 ch. Fasten off. 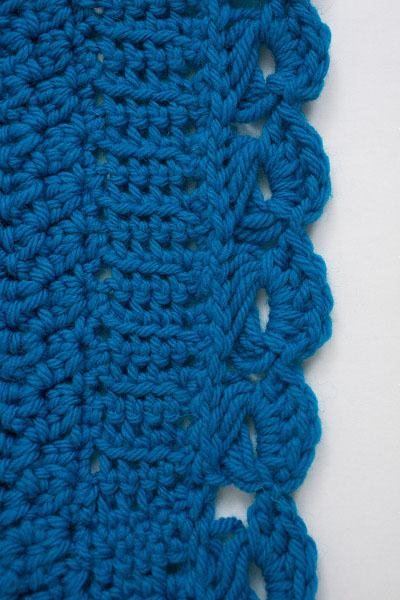 Row 21: Apply sc along the other short side of the scarf, spanning the open areas of the lace with 3 ch. Fasten off. Weave in loose ends and wet block scarf to the measurements indicated. The hat is started with ribbing made by working scs working in flo for the length appropriate for that particular size. Then along the side sc’s are worked, followed by a row of broomstick lace, finished with dc sts. After that sc’s are worked evenly along the other long side of the ribbing and the work is closed in a lp. The body of the hat is worked back and forth instead of continuously in the round. After each round the lp is closed with a sl st.
Place marker (pm) at beg of each rnd. With smaller hook fsc 5. Row 1: Ch 1, sc through flo across, turn. Rep row 1 another 49 (53) times, for a total of 50 (54) rows. Row 2 (RS): Turn work and sc 60 (65) evenly spaced along edge of the strip made, about 12 sc per 10 rows of ribbing, turn. Row 3 (WS): Place the lp over the dowel, then * insert hook into next st, draw a lp through and put it up over the dowel. Rep from * till end. Row 4: * Insert hook into the first 5 lps, YO and pull through the 5 lps on your hook. Work 5 dc into the lp. You can now remove the dowel from all the lps. Rep from * until all lps have been worked. Fasten off. Row 5: Turn work and with RS facing sc 60 (65) evenly spaced along the other edge of the ribbed strip. Join round with sl st and pm to indicate starting st of round. Rnd 1: Ch 2, sk first st, 2 esc in next st, * sk next st, 2 esc in next st; rep from * around, join with sl st in top of beg-ch, turn. 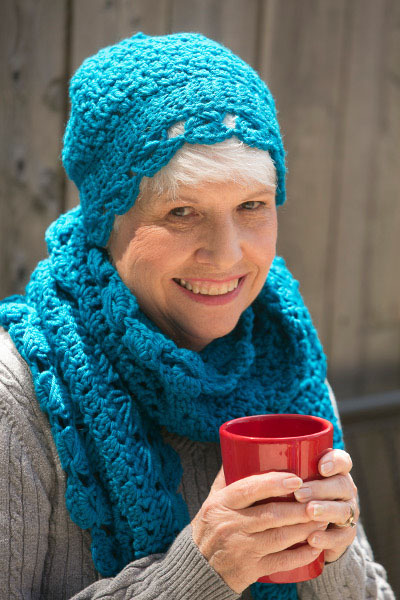 Both sizes: Fasten off, close remaining hole in the top of the hat with the yarn tail, weave in loose ends and wet block hat.